The border crossing between Bolivia and Chile was a pretty hysterical adventure for us. It’s amazing to us that even this far along in our journey things can still shock us- but they do! We took a bus from Uyuni, Bolivia into Chile – a 12 hour bus ride with a stop at the border crossing. Usually an easy enough process- hop on, grab your bags, exit one country through immigration and enter the next country. Well this border crossing was a bit different. First, we stopped off in Bolivia got our stamps and paid our exit fee and then got back on the bus to be driven to the Chilean side. Easy Peasy! Once at the Chilean side we lined up and said about 1 word to the guy who stamps our passports and headed back to the bus where we had to unload our luggage. No problem, all of the tourists grab their luggage and lay it out in a nice line where as the Bolivian people are unloading bags and bags and bags of stuff (stuffed in different coloured plastic bags) and dumping them everywhere. Next we were all told to stand up against a wall while they searched our bags and sent out the drug dogs. Well it was only a matter of time before they started searching these plastic bags and started pulling out containers and bags full of... cookies and crackers (bet you thought it was drugs!). The amount these 2 ladies had decided to carry-over on the bus was actually pretty astounding. It seemed like it was never ending! Well it was quickly deemed unacceptable so they had to load all these bags back on to the bus along with these 2 woman and drive them back to the Bolivian border where they could dump all of their goods. They did end up coming back empty handed and being allowed into Chile but this was a sight none of us gringos will forget anytime soon. Chile is definitely the most North American feeling country we’ve been in while in South America which makes it the perfect stop to end our 10 month trip before we head back home for Christmas. Besides the fact that very few people actually speak fluent English we could have easily mistaken it for Canada or the United States. There aren’t many people dressed in traditional clothes like we’ve spotted all throughout the rest of our travels, the grocery stores offer similar foods and prices are relatively the same as they are back home. What we couldn’t believe are the prices of taxis! We started to wonder why everyone would take shared taxis and all the taxis always had max passengers but it’s because they cost so much to take. Lucky for us uber is very popular and easy to use down here and almost half the price of taxis! We rented this amazing apartment right on the water right outside of La Serena in a suburb called Coquimbo. We spent every day waking up to the sun peaking in our windows and going to sleep being lulled by the ocean waves. It’s just coming into summer time for Chile so the beaches aren’t overly packed yet which made it the perfect time for us to visit. With weather averaging 23-25 degrees and little to no tourists we basically had the area to ourselves! We’ve been focusing on growing our business while in Chile so our office looked a lot like this for a couple of hours a day- I don’t think either of us complained once! It certainly beats the old office cubicle. While we were in Coquimbo we decided to take advantage of how clear the sky is and go on a star gazing tour at the Mayu Observatory with Tembeta Tours. Neither of us had ever been to an observatory so this was a really cool experience for us. We left the city just as it was getting dark and headed to the Observatory which was about 20 minutes away from La Serena. When we arrived and got out of the vehicle and our eyes adjusted to the darkness we couldn’t believe how incredible the sky was. It was such a clear night that both of us agreed we’d never seen the night sky quite so clear like that night. 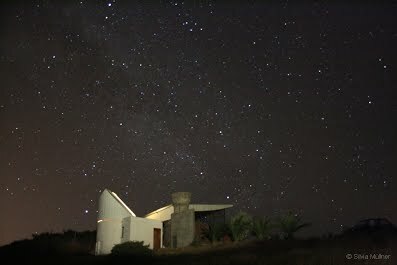 After admiring the sky from afar we were given a glass of wine and were led up to where the telescope was held. From here we took turns, back and forth, discovering so many incredible things this Universe has to offer. We were lucky because our tour guide Cristobal spoke great English so he explained all the details of what we were seeing which included my personal favourite for the night- admiring the different rings of Saturn! As our month in Coquimbo came to an end we hopped on a 7 hour bus down the coast to our next stop, Vina Del Mar, a city just outside the iconic Valparaiso. Here we will spend nearly the rest of our trip before heading home November 30th. Stay tuned for our adventures around here!